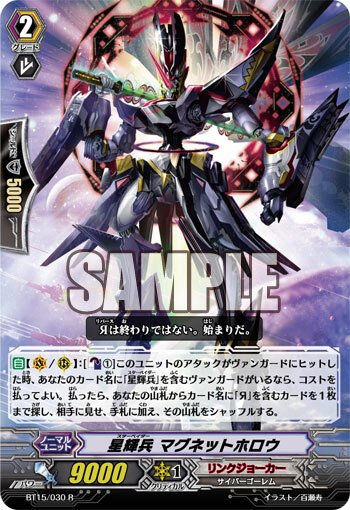 [AUTO](VC/RC):[Counter Blast (1)] When this unit's attack hits a vanguard, if you have a vanguard with "Star-vader" in its card name, you may pay the cost. If you do, search your deck for up to one card with "Яeverse in its card name, reveal it to your opponent, put it into your hand, and shuffle your deck. "Яeverse is not the end, it is the beginning." A “Cyber Golem”, one of the half-organic combat weapons that “Link Joker” uses for Suppression-based combat. Its Model Number is the “CG-00150030”, while its identification code is “MagneT-HolloW”. This soldier is specifically a mass-produced model of “Knight of Entropy” for the “Star-Vaders”. Unlike the original Knight of Entropy, this guy was designed for combat from the beginning, so its exterior is much more aggressive looking the original model. Among some of the creatures that were “Яeversed”, their bodies were enhanced, but a few became so strong that they couldn’t even be controlled. These “Magnet Hollows” were built to collect, and sometimes, eliminate them. These machines contain senors capable of distinguishing pure “Void” from those who have gained the power of “Void”. Яeversing is the beginning, not the end. It is a curtain that pulls the curtain of the old away and reveals the new, true self… … It is a rite of passage for those beginning their life as a part of “Link Joker”. Would be much less practical if it was just VC. Eh. Grandiose wasn't going to be nearly as viable without this, so it had to be done.